The late Honorable William Alston-El is featured in Frederick Douglass in Washington, D.C.: The Lion of Anacostia, cited 8 times by 2019 Pulitzer Prize Winner in History. For a distinguished and appropriately documented book on the history of the United States, Fifteen thousand dollars ($15,000). 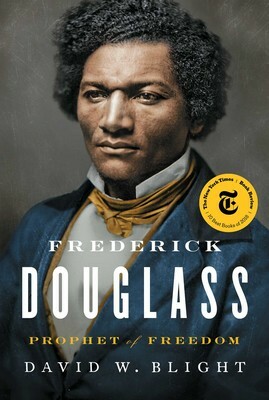 A breathtaking history that demonstrates the scope of Frederick Douglass’ influence through deep research on his writings, his intellectual evolution and his relationships. A morally engaging investigation of torture that measures American ideals of democracy and equality against a dark, uncomfortable reality. A beautiful restoration of the world of botanist and surgeon Dr. David Hosack whose forward-looking views embodied early American ambitions in transatlantic scientific discourse. David Blight: “We didn’t even get to talk about the older Douglass and all the rest of the women.” Washington College continues to disgrace intellectual and scholastic legacy of Dr. Douglass by dumbing down history, unable to uplift history of Douglass on the Eastern Shore without repeating Dickson Preston. The New Haven Program Committee and Yale’s MacMillan Center invite you and your guests to a conversation about David W. Blight’s rich and comprehensive biography, Frederick Douglass: Prophet of Freedom, featuring David W. Blight and Robert Stepto. Crystal Feimster will moderate the conversation. A limited number of spaces are available for a small dinner at Heirloom Restaurant following the reception. Interested members can log in to register for both the program and the dinner online. Please contact Hannah Gersten with questions. Lisa Brooks’s “Our Beloved Kin,” published by Yale University Press, was praised for how it “imaginatively illuminates submerged indigenous histories,” drawing readers into “a complex world of tensions, alliances and betrayals” that fueled the conflict between Native Americans in New England and European colonists and their Indian allies. The Bancroft, which includes an award of $10,000, was established in 1948 by the trustees of Columbia University, with a bequest from the historian Frederic Bancroft. Thank you to the Gilder Lehrman Center at Yale University for hosting the wonderful discussion. I will respond in a forthcoming series of videos detailing some of the intellectual and scholastic shortcomings in this presentation. W Street Douglassonians will prepare a petition for debate with the moderator being chosen by Coates and Blight, with our suggested recommendations. Last year I had the opportunity to meet and speak with Don Rush, host of Delmarva Public Radio’s program Delmarva Today, about Frederick Douglass’ 1877 visit to Cambridge, Maryland. My speaking with Don was due the relationship and recommendation of Eastern Shore community historian Linda Duyer, who first documented and introduced to the public information on the lost visit of Frederick Douglass in February 1880 to Salisbury, Maryland in Wicomico County. Don also spoke with Ms. Duyer last year. Last month Rush interviewed Yale University professor David Blight about his new book and the time Douglass spent on the Eastern Shore.